This past summer, my sister and I drove 4,000 km/2500 miles in 8 days to attend a family reunion in Ontario. The trip was exhausting, but I treasure every minute I got to spend with my sister who lives five hours northeast of our farm near Montmartre (Mo-mart), Saskatchewan. 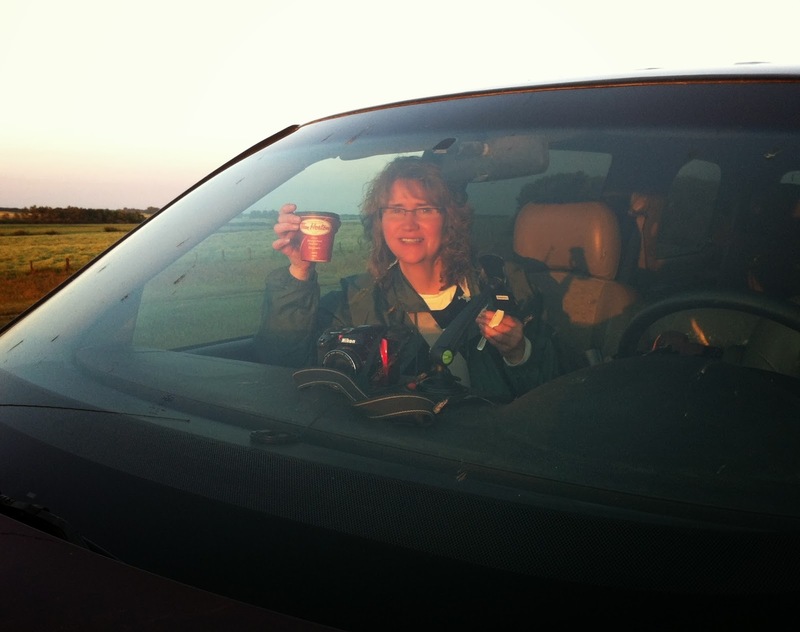 Bonnie and I rendezvoused on the TransCanada Hwy #1 about 2 am on July 30th, and headed east. It seems like a weird time to travel, but Bonnie had to work until 9 pm before taking the long drive down to meet me. Also, there aren't as many tractor trailers/semi-trucks/18 wheelers on the road at that time, so it's less stressful than the daylight. Of course there are deer and moose, and other critters, but that just means a watchful eye on the road. We crossed the provincial border from Saskatchewan into Manitoba at 4 am just as a sliver of grey appeared above the horizon. And 6 am found us stopping at Brandon for a much needed cup of Canada's favorite coffee - Tim Horton's. We spent the morning travelling across the flat prairie of Manitoba until about an hour from the Ontario border, the prairie suddenly disappeared and we were in the trees and rocks of the Canadian Shield. Driving across the Canadian Shield is hazardous at night with its hills, turns, and ever-present rock cuts, but after years of living on the prairies, I savored the colors and textures of my birth province. Although Bonnie lives among the trees and hills, she considered it her duty to take a photo of every rock, tree and lake we passed along the way. And I'm so glad she did because I had to keep my hands on the wheel and she took many of the photos you see here. At 7:53 pm we neared the outskirts of Thunder Bay and my tired, but watchful eyes picked up movement on the north side of the highway. I slowed and then pulled onto the shoulder as I made out 2 moose browsing in the area between the road and trees. If this YouTube doesn't work, check it out on my YouTube Channel. We pulled into the city of Thunder Bay at 10:30 pm that night where our mom was waiting up for us. 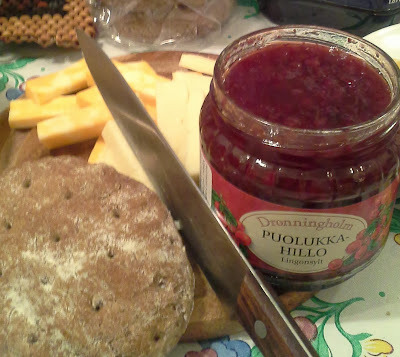 The next morning, I knew I was 'home' when breakfast included scones from the Current River Bakery and a newly opened jar of Finnish Lingonberry jam. As usual, a trip to Thunder Bay wouldn't be complete without a brief stop on High Street to gaze across the harbor at the familiar vista of The Sleeping Giant. 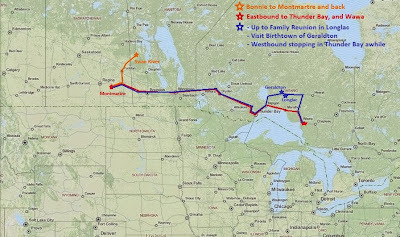 On August 1, Bonnie and I took to the road again, heading east toward Nipigon for the second leg of our journey. Of course, we took full advantage of pit stop adventures, like this one at the Ontario Travel Information Centre in Nipigon. This is one of those self-portraits where I set my camera on a tripod, click the timer, then run like crazy to get into place. Instead of turning north at the Nipigon junction like we normally did, we headed south and east near the northern shore of Lake Superior toward Wawa where we were expected for lunch. This area is known for the iron in the rock which gives it a reddish color. 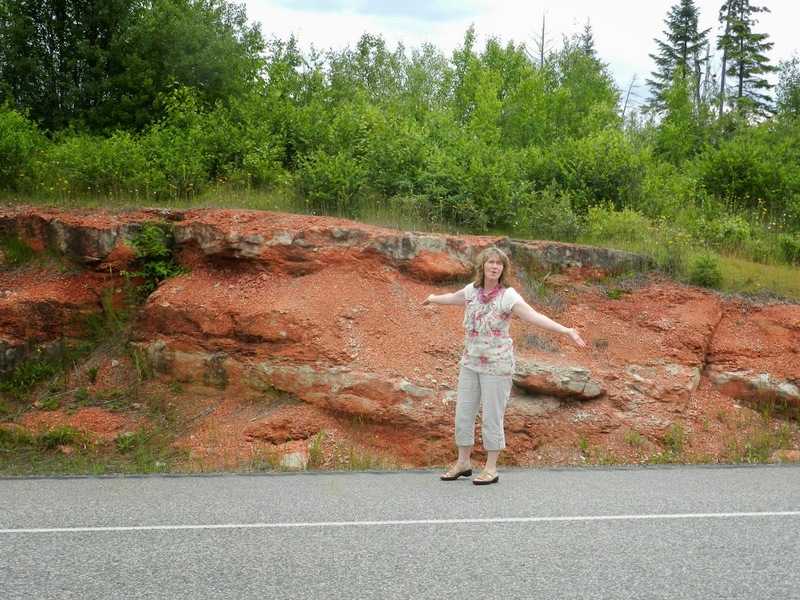 The town of Red Rock is on the west side of Nipigon, and the highways are paved with pinky/red asphalt. But it wasn't until we were on the east side of the junction that we saw the splendid color in the rock cuts along the highway. 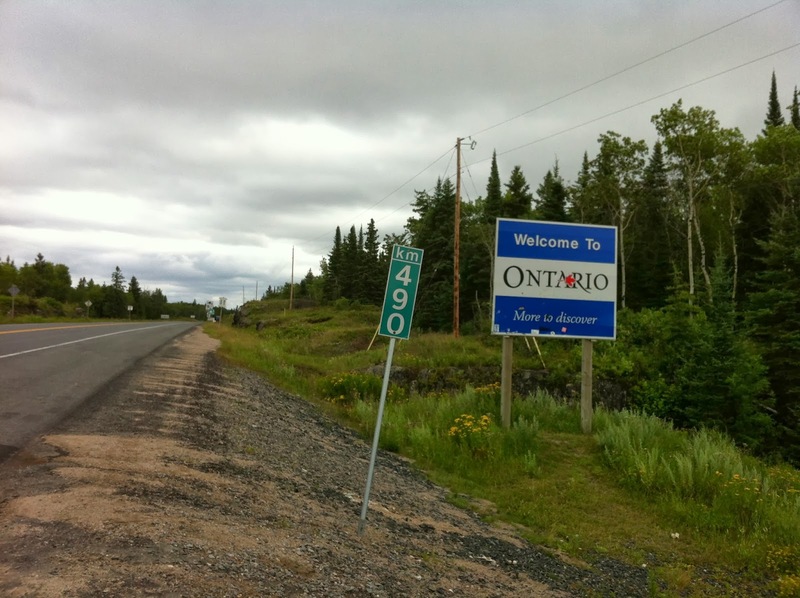 Three hours later, Hwy 631 ended and we turned west toward Longlac, 149 km/92 mi away. I tell you, driving toward the setting sun is not where I want to be, but a brief prayer was quickly answered by a cloud moving into position between me and the solar orb. Dusk fell and we realized we needed to make one last pit stop if we wanted to make it safely to Longlac. 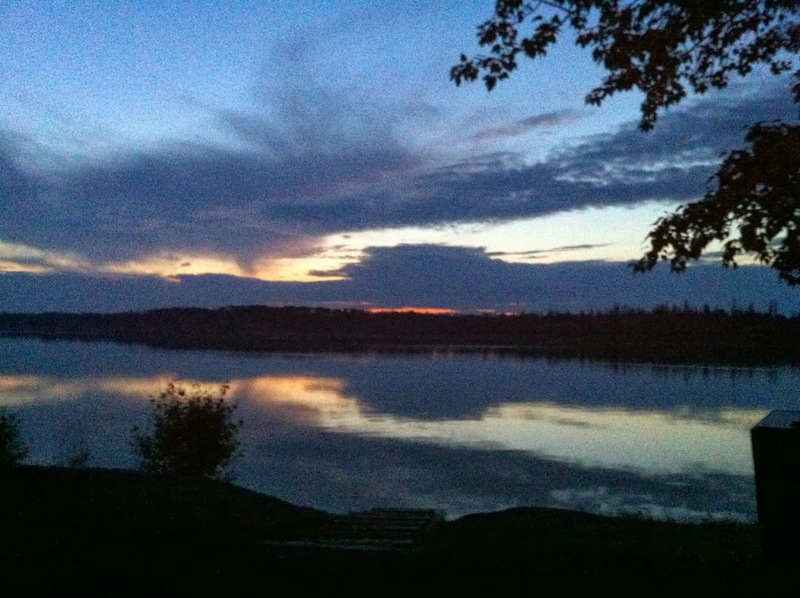 Again, our need was answered as we arrived at the Klotz Lake Rest Stop at 10:05 pm with a gorgeous sunset to ease our travel aches. Half an hour later, we shared a joyous family reunion which included Aunt Taimi, who lives in France - and whom we hadn't seen in a dozen years, but who regularly shows up on my blogs and Facebook page , and her son, our cousin Edward from England whom we'd never met. I've always enjoyed my visits to Longlac and never tire of the view from their livingroom window. It was raining on Aug 2nd which was our designated day to visit, so I didn't get the shot of the bridge that I wanted, but there's enough in this following photo to bring back happy memories. The pylons sticking out of the water are leftover from the logging days when huge booms of logs were tied there until needed. On Aug 3, we spent some time taking family pictures outside in the rain under Longlac's landmark - a reminder of the Hudson Bay Company's Long Lake post which was built near the North West Company's fur trading post. After hugs and kisses, Bonnie and I headed back to Thunder Bay, but not before I took a final photo of my aunt's house while crossing the bridge. On our trip back to Thunder Bay, we stopped for an hour or so to explore Geraldton and share our earliest memories of when we lived there, my birth town. And although I took loads of pics, that's the topic of another post. I will add that wherever we expected to see Geraldton on a green highway sign, we found the word Greenstone instead. We'd asked our aunt about it and she explained that the 3 communities of Longlac, Geraldton, and Jellicoe had banded together under the name Greenstone. As well as being a tourist zone, the 3 communitties were able to save money and duplication in their budgets and logistics. However, my aunt said it's disconcerting to some tourists who expect to see a community of 5,000 and instead find the population scattered among the rocks, trees and lakes. All this to say that if you can't find Geraldton on a new map, try Greenstone. I have much more photos of rocks, trees and lakes, but I'll spare you those today. At Nipigon, we turned west toward Thunder Bay, but suddenly, I slammed down the brakes and yelled for Bonnie to grab the camera. As I rolled to a stop on the shoulder of the road, she zipped down her window and pointed the camera at the small black bear rooting beside the road. "Where there's a baby bear, Momma bear's not far behind," I warned as Bonnie leaned out the window snapping pics. I cranked my head around looking for a large black moving object, but couldn't see one. The cub disappeared into the bush, and I raised Bonnie's window - just in case. As we started on the road again, I can honestly say I felt good to be alive. 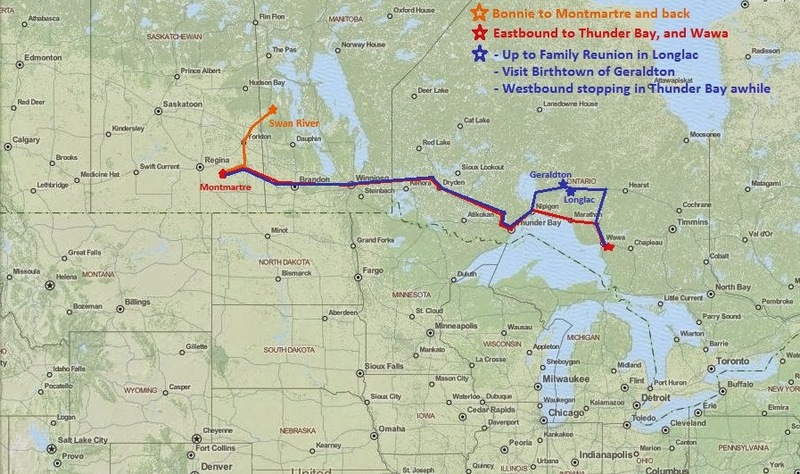 After spending several days in Thunder Bay, Bonnie and I headed west for home. As we neared Brandon, I felt an overwhelming need to pray for people I'd met on the trip, and to praise for keeping us safe. And although I'd been praying right there at the wheel, I wanted to do it at the tiny Wayside Chapel overlooking Brandon. We spotted it in the gas station parking lot. There was enough room inside for 6 people - one small pew each. We prayed and praised and it felt good. We pulled into Draper's Acres at 11:30 pm that night. Excruciating pain in my arthritic knee had me limping to my door, but oh, I was so glad I'd made the trip. Have you ever taken, or are thinking of taking a trip down memory lane with a family member? I'd be honored if you'd share your experience, or your dreams for the future. This post really touched me, Anita. I am so glad and a bit envious that you had such a trip with your sister. What memories together and the chance to see your extended family and places that mean so much to you. Ontario is just lovely. I love my own memories of primitive camping in the middle of such beautiful country. I would have been taking just as many photos of the rock. Those cut throughs on the highway are pretty common here in upstate and I would love to examine them more closely as I rush on by. Thanks for sharing thie amazing trip with us and of course I look forward to your post on your hometown. 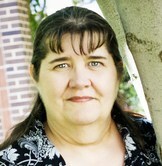 And Deb, I'd love to drive through and explore your beautiful state, too. I've flown over it and saw so many places that caught my eye from high above. I think autumn would be a perfect time, but I'd welcome any time of the year. Technically, our trip was to Northwestern Ontario only, because Hornepayne is in Northern Ontario - a huge chunk of land which almost reaches Ottawa. Just beautiful--words and pictures. What a trip, Anita Mae! The scenery is gorgeous. Loved the shot of the black bear cub, too. But I would have not wanted to linger, either. I haven't done a road trip with my sister since before she was married although we have been in our hometown together several times. That's easy as it isn't that far from where we live (an hour for her, 1.5 hours for me). When my husband and I travel together, I am the appointed one for photos through the car window. I've gotten so that I am able to figure out what he wants pictures of...which is a lot of things! :) Usually on our road trips it takes me a little bit of time on the first day to remember my "job"! And how blessed you were to see all those animals. Somehow we keep missing animal sightings in our travels!! I was born in a city and lived there until I was 3 ish, then moved to my hometown and didn't move away until I was in my forties. That will always be my hometown and I get a bit nostalgic when I visit, even though I've my current home has been 'home' as well for over forty years too. I guess it has to do with memories more than years. thanks for sharing it all, Anita! Susie, that was a once in a life-time shot for sure, because even in the wild animal parks we'd never get that close without a fence between us. Hi Elaine! I've been missing you. The thing is, I've travelled from the west to the east and back countless times - and vice versa when we lived in Ontario and our folks lived in the west - and this was our first double bingo. Before, we've seen the animals in the distance, but not this close. I think part of that was the timing since it's a known fact that you must be extra vigilant in the early morning and late afternoon/evening when the animals are seeking food and water. So glad you stopped by, but you have me wondering about your remark that it takes 1.5 hrs for you to get to your sister's place, but 1 for her to get to yours. Hmm... perhaps I'm reading that wrong. Thanks for the reminder because I want to put a shout out here for Bonnie. She came ready and willing to help me get the job of driving done, and not only did she enjoy taking pics of whatever I pointed out, she was the perfect aid - almost second-guessing me sometimes when I moved to uncap my water bottle, etc. She even got the hang of using my Gas Buddy iPhone app to find the nearest and cheapest gas stations. Haha...Neither my sister nor I live in our hometown. She's an hour away from our hometown; I'm 1.5 hours away and we've met there several times...driven around the area, camped there, etc. Yes, animals are more visible at dawn and dusk! What is it with me and numbers today? By the way I read your last comment, Deb, your over 80 yrs old! What a fun post. I live so close to Quebec and Ontario, I believe I'm Canadian half the time. Of course, out here, the Canadian land is flat as it becomes the Laurentian plain. I especially loved that itty-bitty church and your obedience to pray. 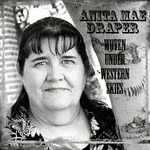 Awesome, Anita Mae! I love love love these pics and the story of you traveling with Bonnie. It's wonderful and I'm so glad you were able to take this trip. Thank you so much for sharing. My favorite pic? The one of you and Bonnie in the face cut-outs. Cute! Back in the early 90s, we lived 45 miles southeast of Ottawa in the Ottawa Valley, near the 417 to Montreal. And you're right - except for the Laurentians - it was as flat as the prairies. I wish I'd spent time in and around New York state when I had the chance, but back then our daily commute to Ottawa, parking fees, etc, took up much of our budget. By the way, that cut-out photo was another one of those self-portrait ones where I set up the camera and run. But the first time we tried it, I almost knocked the camera down when my foot kicked the tripod leg and I had to scramble to avoid breaking the camera. The next couple attempts were write-offs because I was too low and you could see open air on top of my head. So even though I'm too high on the posted one, it's the best of the lot. The mosquitoes were biting that morning. I guess I should have pouffed up my hair a bit - or rather, had Bonnie do mine since her hair always looks so nice. By the way, Suzie, about a mile or so down the road from where we took that cut-out photo, I pulled into a lookout area - you know where you can look out over the view? It was the same place I'd stopped many times before, but this time it was really unkempt. They'd allowed the trees to grow on the other side of the guard rail so I couldn't see the view no matter how high I raised my camera. Perhaps they were letting it grow because the housing growth now hid Nipigon Bay. I really don't know. However, you know that black bear photo? Well, after Bonnie took that pic and I pulled back onto the highway, I realized we were right across the road from the overgrown lookout spot! LOL Suzie... I know you like your baseball, but I don't think the Chicago cubs are your favorite team, so I'm going to assume you're talking about real bears. Hey Auntie Taimi, it was a wonderful visit! Thanks for checking out the post. I enjoyed going the replay while creating it. At the back is a bookshelf with tracts and used Bibles. There is a sign to take whatever you need and that donations are accepted, but not required. There are also a couple old hymn and prayer books. Honestly, there should be more of these around. The only other one I know of this size for travellers is in Drumheller, Alberta and that's off the beaten track - unless you're going to the Paleontology Museum. late to the post, but i really love the narrative with the pictures. it's a wonderful peek into your family and Canada as well. i always enjoy that. plus, your pictures remind me of Colorado a little bit - which makes me a tad homesick, but also warms me some with my happy memories of travel with family. just wanted to drop a line and let you know i enjoyed the post.